“The Bermuda Depths” is part ghost story and part love story with a touch of Japanese monster movie thrown in to the eerie proceedings for good measure. And this unlikely combination of elements has ensured the ABC TV movie — filmed completely on location on the island in 1978 — retains a worldwide cult following more than 30 years after its premiere. The highest rated film broadcast by ABC in 1978, this Boy Meets Spectral Girl Meets Giant Turtle story was released theatrically in Europe and some other international markets. 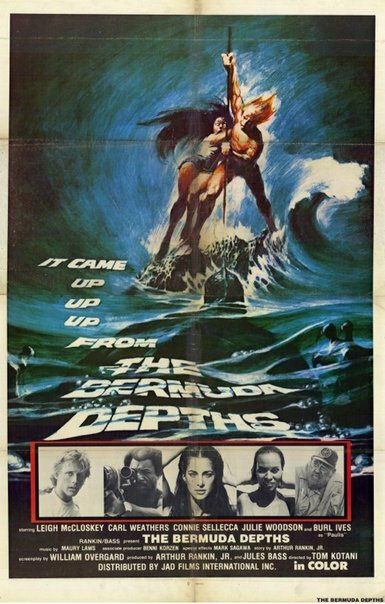 “The Bermuda Depths” found an after-life of sorts on cable television channels and DVD, drawing new generations of fans to the haunting tale. A Facebook page devoted to the film now boasts more than 300 members. The TV film starred Carl Weathers [Apollo Creed from the "Rocky" series], Oscar-winner Burl Ives ["Cat On A Hot Tin Roof"] and model-turned-actress Connie Sellecca [who later starred in the TV shows "Greatest American Hero" and "Hotel"]. Dozens of Bermudians appear in the film in supporting roles. 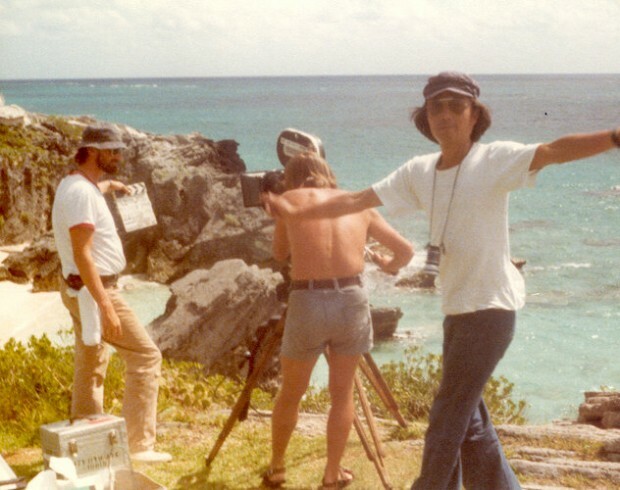 Many more worked behind the scenes on a production which showcased the island’s picturesque underwater scenery every bit as much as it did land-bound attractions ranging from South Shore beaches to the “Deliverance” replica in St. George’s. Along with the following year’s “Ivory Ape”, “The Bermuda Depths” is one of two TV films he made on the island. “I always like to work close to home,” Harringston Sound resident Mr. Rankin once joked about his twin Bermuda TV films. Special effects and creature elements were handled by Japan’s Tsuburaya Productions. Magnus Dens [Leigh McCloskey] lies asleep on a Bermuda beach, his hat shading his eyes from the sun. He is approached by a beautiful but mysterious woman [Sellecca], who kneels next to him and notices the coral necklace he is wearing. Removing his hat, she seems to recognise him, and gently caresses his face. Magnus dreams of his childhood, playing on the same beach. He finds a turtle egg in the sand, and calls to his friend Jennie to have a look. As they watch, the egg hatches. A few years later, Magnus and Jennie play with the rather large turtle. Magnus takes a shell and carves “J+M” inside a heart on the turtle’s shell, while Jennie finishes making a coral necklace, which she places around Magnus’s neck. Later, the young Magnus lies alone on the beach. He spots Jennie riding the turtle through the waves, heading out to sea. He calls to her, but she doesn’t hear him as she and the turtle disappear beneath the water. That night, in his house on a cliff side overlooking the beach, Magnus’s father, Lionel, checks on him in bed as a terrible storm rages and strange calls can be heard from the ocean. Something unseen approaches the house as Lionel descends into a cave beneath the house to continue an experiment in marine biology. The storm intensifies, blowing shingles off the roof and destroying part of the house. Lionel attempts to flee the unseen horror stalking him, but is knocked into the water. Magnus is pinned under the collapsing roof in his bedroom. Magnus awakens from his nightmare and groggily gathers his things. He sees a woman swimming in the ocean and looks at the remnants of his childhood home before he leaves to go into town. At the docks, Magnus spots his childhood friend Eric [Weathers]. Eric helps him on board a ship and asks where he’s been. Magnus admits he’s been drifting for a few years. Eric takes the boat out to sea and gets Magnus to help him lay a heavy deep-sea trawling net. Eric introduces Magnus to Dr. Paulus [Ives], whom Eric is working for to finish his degree in marine biology. Suddenly the boat lists violently to one side. They pull up the net to find it has been shredded by something very large and strong. That evening, the three men are joined by Eric’s wife Doshan [Julie Woodson] for dinner at Dr. Paulus’ house. He explains he and Eric are studying teratology, the study of unusual growth in animals. Dr. Paulus calls out to Delia [Ruth Attaway] to hurry up with dinner. Magnus is intrigued by the necklace she wears, which resembles his own. After dinner, Paulus expresses his admiration for Magnus’ father, whom he worked with, studying the Bermuda Triangle. Magnus tries to ask about the night his father died, but Paulus drifts off to sleep at the table. Stepping outside, Magnus again sees the mysterious woman swimming by the boat. He jumps in the water to follow her, but is quickly overcome underwater. He is saved and revived on the beach by the woman, whom he doesn’t recognise. She returns to the ocean, telling him her name — Jennie Haniver. Angered, Magnus steps outside, where Delia tells him of the legend of Jennie Haniver. Appearing sometimes as a young girl and sometimes as a grown woman, Jennie only appears to men about to drown. Two centuries ago, she was returning to the mainland when her ship was caught in a storm. Fearing for her life, Jennie prayed for salvation to “the one below”, the devil that resides in the Bermuda Triangle. Pleading that she was too young and beautiful to die, she asked that the rest of the crew be allowed to drown if she could be saved. A voice in her head told her to dive into the sea and she would be preserved. Magnus becomes upset at what he describes as a stupid ghost story and runs off. The next morning, the police bring in Eric to examine enormous tracks on the beach. He measures them as being forty feet across. Magnus goes down to the beach and meets Jennie. Finally remembering her as his young playmate, he takes her to his father’s wrecked house. He tells her some of his memories from childhood, while she describes the quadrilles her father would hold in their great hall. Eric calls Magnus away, despite Jennie’s requests for him to stay with her. They go out on the boat with Dr. Paulus and discuss the prints on the beach and Paulus’ belief they were caused by a giant turtle. Again, the boat lurches uncontrollably. Eric is forced to cut the cable to the trawling net before the boat capsizes. In the evening, Magnus confronts Dr. Paulus about his father’s death. Paulus explains Lionel was conducting tests regarding mutation in sea life when he was attacked and apparently eaten. Magnus asks him if he remembers the turtle from his childhood, and describes how he carved initials in the shell, for himself and Jennie. Paulus is dismayed. Magnus awakens to Eric and Dr. Paulus arguing over pursuing the giant turtle. Eric wants to use the Hora, a harpoon-firing bazooka. Paulus is aghast at the idea and withdraws his support for the expedition. Despite this, Eric collects Magnus and heads out in the boat. After some trawling, they again find something dragging on the line. Taking a small harpoon gun, Eric dives to try to save the net. He shoots at a form he could see only vaguely, which turns out to be Jennie. Eric and Magnus resume trawling. Magnus tells Eric he had been with Jennie the night before on the beach, and how she was his friend from when he was young. Eric doesn’t remember her, and dismisses her as an imaginary friend. The trawl lines finally catch the turtle, which is so large it begins to tear through the net. Eric blasts it with the Hora, and allows it to run out the line, waiting for it to resurface. After sundown, the boat’s power mysteriously gives out, and the compass spins crazily. Magnus leaves the boat’s cabin and finds Jennie has boarded the ship. She begs him to free the turtle, nebulously saying she made a promise long ago she’ll forever regret. They embrace, Magnus not noticing the gaping wound in her side from Eric’s harpoon. At Doshan’s insistence, Dr. Paulus boards a helicopter to fly out to the boat. Upon arriving, he observes a huge shape underwater near the boat. The turtle surfaces, swimming quickly towards the helicopter, then leaping out of the water, sending the helicopter crashing into the ocean. Eric sees the crash and rushes out onto the deck, to be confronted by Jennie. To his horror, her eyes glow an eerie green, just as the turtle surfaces under the boat, capsizing it. Magnus climbs aboard the lifeboat amidst the wreckage and desperately tries to help Eric on board, but he is entangled in the line from the Hora. The turtle surfaces, its eyes glowing exactly like Jennie’s, before it dives down into the depths, dragging Eric helplessly behind. Magnus manages to steer the lifeboat to shore, but does not make it far along the beach before he collapses unconscious. Jennie approaches him, kissing him sadly before she returns to the ocean for the last time. Doshan approaches Magnus in the graveyard where his parents are buried and expresses her horror at the losses of her husband and Dr. Paulus. Magnus tells her he is leaving Bermuda and wants nothing to do with the sea ever again. As he walks away, he does not notice the statue of Jennie on her gravestone, inscribed, “Jennie Haniver, 1701-, Lost at Sea”. On the ferry leaving Bermuda, Magnus removes the necklace Jennie had given him and sadly throws it into the sea. It sinks past the giant turtle, which is shown as still having the initials Magnus inscribed in its shell so many years ago. I would like a copy as well! Copies were available once on Warner Home Movie DVD – Classic collection. I am not sure if the title is still available though – - – I know that I have a copy. We have a page on facebook about this same movie, I am looking for the ABC promo that played before this movie also, join us and I love your review!